(Nanowerk News) In the National Institute of Advanced Industrial Science and Technology (AIST) in Japan, Shimizu Hiroshi (Nanostructured Materials Group, Group Leader) et al. 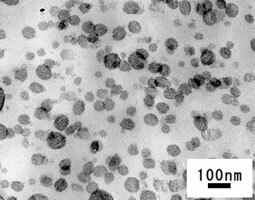 of the Nanotechnology Research Institute have developed a new polymer-blending technique using high-shear flow field, and succeeded in making miscible-polymer blends with nano-dispersion structures. Using this technique, the researchers succeeded in blending polyvinylidene fluoride (PVDF) and polyamide 11 (PA11) without any additives, which have been very hard to mix with each other at the nano-level until now, and have prepared blends in which PA11 with a domain size of ten to several tens of nanometers (1 nm = 10-9 m) is homogeneously dispersed densely in the PVDF phase. Until now, for immiscible polymer blends, additives have been used for nano-dispersion, but they work as impurities and cause defects, resulting in problems for practical use. On the other hand, it has been considered that there is a lower limit to the domain size of the dispersed polymer phase when using purely mechanical blending. In this work, the researchers have, for the first time, realized nano-dispersion structures in polymer blends with a high-shear processing technique but without any additives; the dispersed domain sizes obtained are over one order smaller than the previous limit value. Furthermore, they have found that the nano-structures can remarkably enhance the mechanical properties of the blends. This method is also considered to be useful for inorganic dispersants such as carbon nanotubes, and thus can be applied to medicines and cosmetics. Moreover, as not only blending but also cross-linking reactions can be done at the same time under a high-shear flow field, the creation of new elastomers can be expected.